When a pulse passes through a capacitor the baseline must be suppressed slightly in order to make the net area of the pulse above and below the baseline equal. This is baseline shift and for a succession of pulses may be significant. The MCA will measure the height of the pulse relative to a fixed voltage and so variations in the baseline to the pulse will cause errors in the measured pulse height. To avoid baseline shift, such a baseline restorer circuit has as its main purpose the return to zero of the baseline between pulses in as short a time as possible. The use of baseline restoration also greatly reduces the effects of low frequency disturbance such as power line hum and vibrational microphonics which may be sent along the signal. The most effective type at high count rate is the gated restorer in which the baseline is maintained at ground potential during the period between pulses. 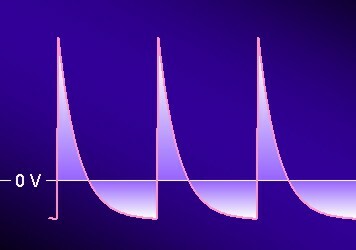 Baseline shift due to a regular series of identical pulses. The total areas above and below the baseline are equal.